Experienced, self-starter with ability to book, manage, and oversee logistical event operation. Assist with coordination of venue events year-round. The event coordinator provides outstanding customer service, is to be an enthusiastic team player, and able to foster, establish and maintain relationships with internal and external clientele. Able to negotiate space contracts and book event space. Where applicable, coordinate vendor relations: food and beverage, audiovisual equipment, and ensure appropriate accents (florals, linens, color schemes, etc.) to meet the quality expectations and budget restrictions. Assist client with maximizing event per budget constraints and provide periodic progress reports to staff directors for each event project. Keep track of event finances including check requests, invoicing, and reporting. Coordinate appointments and visits to see our space, and scheduling of events on the calendar. Ability to accomplish projects with little supervision. Prefer 3 years experience with office administrative management. Prefer 1 year experience coordinating special events. Proficient using the latest versions of Microsoft Word, Excel, PowerPoint, Access, and mail merges; email and web searches. We offer an online employment application. Please follow the link below to access our application. 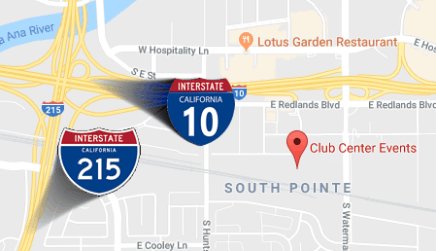 Club Center Events is conveniently located where the 10 fwy & 215 fwy meet. We have a large parking lot to accomodate all your guests vehicles.